Chatuchak might be a long distance from Bangkok’s most popular temples or shopping malls, but it’s a must-visit destination for anyone spending a weekend in Bangkok for one reason: its gigantic open air weekend market. Chatuchak is home to Bangkok’s biggest and most popular outdoor market – the truly gigantic Chatuchak Weekend Market – and several of its most peaceful parks. Although the Chatuchak area is a several kilometres from downtown Sukhumvit and Silom, it’s easy to access using the BTS Skytrain or MRT. Visit on Saturday or Sunday when Chatuchak Market is open to get the most from this part of Bangkok. Stop off in the village-y neighbourhood of Ari for lunch or dinner on your way back – Ari is just two stops along on the BTS. Open on Saturday and Sunday, as well as from six until midnight on Friday night, Chatuchak Weekend Market is one of the world’s largest open air markets. Home to over 8,000 stalls, it’s a great place to shop for clothing, accessories, furniture, art and even pets. Located near Chatuchak Weekend Market, Or Tor Kor Market specialises in fresh fruits and vegetables. From tropical fruit to some of the most important ingredients for Thai cooking, Or Tor Kor Market is a great place for would-be chefs to stock up their kitchens. The Chatuchak area is home to several parks, with Chatuchak Park the original. Built on land donated by the State Railway of Thailand, it opened in 1980 and attracts thousands of visitors daily seeking a relaxing place to enjoy the warm weather. It’s easy to mistake Queen Sirikit Park for part of the larger Chatuchak Park. This small park and botanical garden is home to a selection of plants from Thailand and abroad, a beautiful water feature and a lotus and water lily pond. 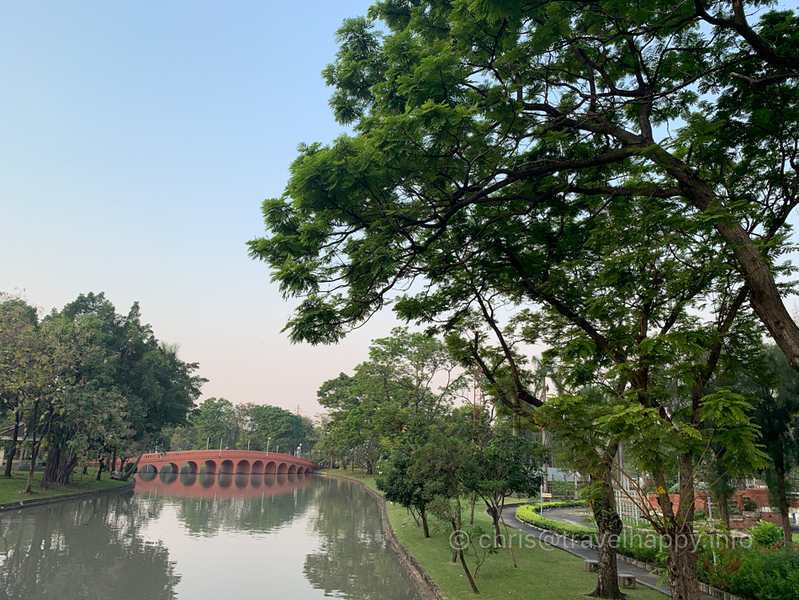 Another addition to Chatuchak Park, Suan Rot Fai is the largest of the three parks close to Chatuchak Weekend Market. A quiet escape from Bangkok’s noise and endless concrete, Suan Rot Fai contains a three-kilometre bike track, with rental bikes available from 20 baht. JJ Mall is a seven-storey shopping centre located within the grounds of Chatuchak Weekend Market. Unlike the open air market, it’s open during the week, with a wide variety of stalls and shops selling clothing, accessories, antiques and other items available in the open air market. Recently renovated, Central Plaza Ladprao is the biggest shopping mall in Chatuchak. Home to a range of retailers, a bowling alley and a large cineplex, Central Plaza Ladprao is easy to access via Phahon Yothin MRT Station. Similar to Pratunam’s Platinum Fashion Mall, Union Mall is a large clothing mall with most of its shops aimed at teenagers and 20-somethings. Clothes are fashionable and inexpensive, with wholesale discounts available for customers that buy in bulk. Bangkok Butterfly Garden and Insectarium is hidden inside Suan Rot Fai. The garden has its own enclosed dome containing more than 500 butterflies. A variety of exhibits about insects and butterflies in Thailand are also showcased. Admission to the insectarium is free. Located on Kamphaeng Phet Road, the Museum of Contemporary Art is a 10-minute taxi ride from Chatuchak Park. A massive variety of visual art from Thai and international artists is on display inside, making MOCA worth the short taxi ride from the BTS or MRT. 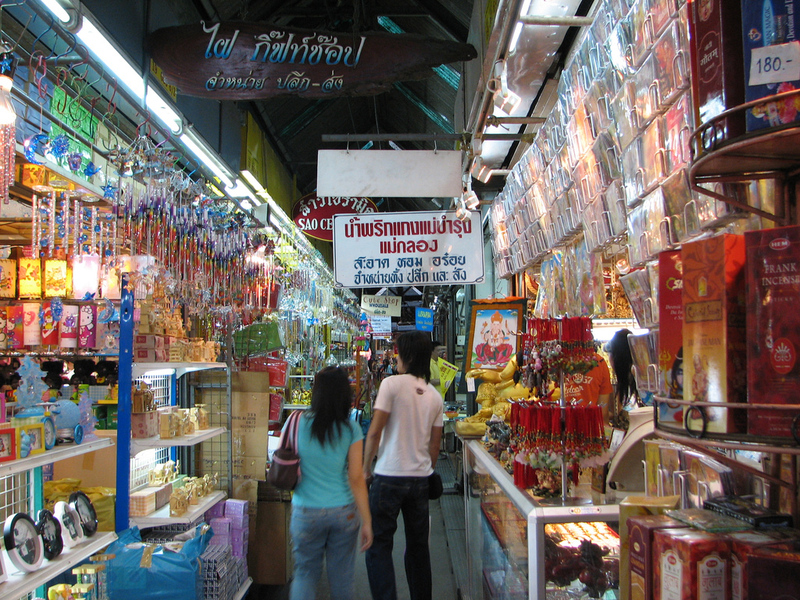 There’s far more than just retail shopping available at Chatuchak Weekend Market. 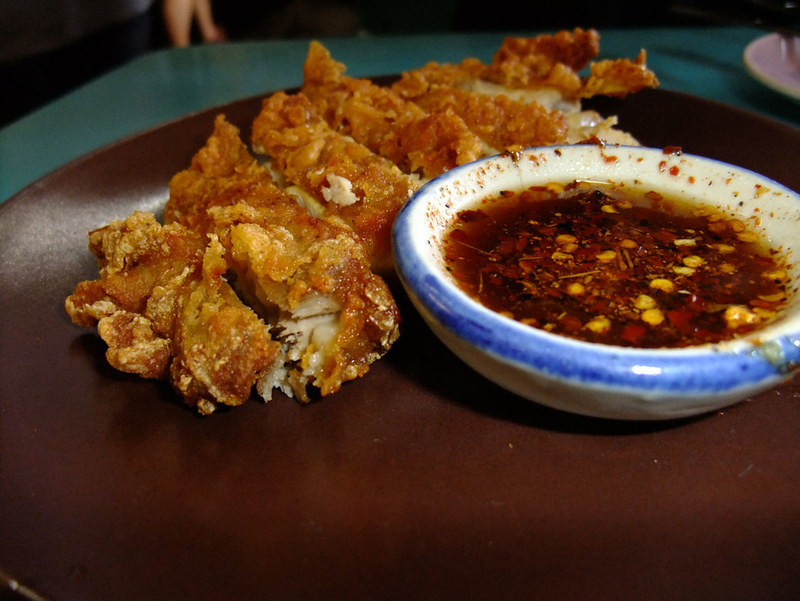 You’ll find a variety of food courts and restaurants inside the market, serving everything from quick and easy Thai food to burgers, kebabs and a range of Western meals. With a location off Vibhavadi Road, The Attitude Wine Bistro & Bar isn’t exactly easy for most travellers to access. Despite the inconvenient location, The Attitude serves a range of fusion dishes and tasty cocktails that make it worth visiting if you’re staying in the area. Quiet and secluded, Spa Foods serves a range of vegetarian and vegan dishes that are ideal for visitors to Bangkok seeking something meat-free. The Chatuchak branch of Spa Foods is located on Vibhavadi Soi 16, with other locations spread throughout Bangkok. Central Plaza Ladprao contains a huge range of good restaurants and cafés, making it a great place to stop for lunch or dinner if you’re staying around Chatuchak. Most restaurants can be found on the 3rd and 4th floors of the mall. Chatuchak might not be the best part of Bangkok for gourmet dining, but Hagi — located in the Centara Grand Hotel at Central Plaza Ladprao — serves high quality Japanese seafood, steak and other dishes prepared using fresh ingredients. The Chatuchak area’s only five-star hotel, the Centara Grand at Central Plaza Ladprao has a fantastic location near Phahon Yothin MRT Station. Rooms are spacious and modern, with a range of suites available. The rooftop Blue Sky bar offers great views of the Bangkok skyline. Northgate Ratchayothin is a modern hotel and serviced apartment complex located less than 10 minutes from Chatuchak Park by car. Its spacious rooms and great facilities — a swimming pool and tennis court are provided for guests — make it a good choice for families. Serene Bangkok Bed & Breakfast is located 10 minutes away from MRT Phahon Yothin and Chatuchak Park by car. Rooms are tastefully decorated — deluxe rooms include a four-poster bed — and the swimming pool, spa and garden are ideal for relaxing in the evening. Located inside Tuk Chang, one of Bangkok’s most iconic buildings, Iyarin@Tuk Chang is a convenient hotel for visitors that want to be close to Central Plaza Ladprao. Rooms are on the building’s upper floors and offer excellent views of the nearby area. Sasha House offers spacious, well decorated rooms ideal for solo travellers and couples. A 10-15 minute taxi ride from Phahon Yothin MRT and Chatuchak Park, its location isn’t ideal, but Sasha House’s inexpensive and comfortable rooms make it a good choice. Located almost 20 minutes from Chatuchak Park by taxi in normal Bangkok traffic, Room @ Vipa Guest House isn’t the most conveniently located hotel for visitors that want to explore Bangkok. However, it’s a great budget choice if you need to fly from Don Muang Airport. Clean, comfortable and spacious rooms make Tuscany Avenue Service Apartment a great option for budget travellers that want to stay near Chatuchak Market. Located on a peaceful street five minutes from Chatuchak Park by car, Tuscany Avenue is a quiet budget option. Baan Mi-Na is another convenient two-star hotel for travellers that need to access Don Muang Airport without navigating Bangkok’s traffic jams. Located around 15 minutes from the airport, it’s also reasonably close to Chatuchak Market, CentralPlaza Ladprao and Union Mall. Baan Chatuchak is conveniently located minutes from Chatuchak Weekend Market. Although its central location means that it can get quite noisy on the weekend, Baan Chatuchak is one of the best low-cost choices in the area for visitors that want to do some weekend shopping. G9 Bangkok Hotel is a clean, comfortable hostel located less than two minutes away from the BTS station at Mo Chit. Double and twin rooms are available, along with a selection of family rooms and dorm beds. Located on the rooftop of the Centara Grand Hotel at Central Plaza Ladprao, Blue Sky serves great drinks with a fantastic view of Bangkok. Drinks are more reasonably priced here than at the sky bars in Silom and Sukhumvit, while the view is less busy and more relaxing. The Chatuchak area is a major public transportation hub, making it easy to get to and from the Weekend Market regardless of where you’re staying in Bangkok. BTS Mo Chit, the final station on the Sukhumvit Line, is a short walk from Chatuchak Weekend Market. 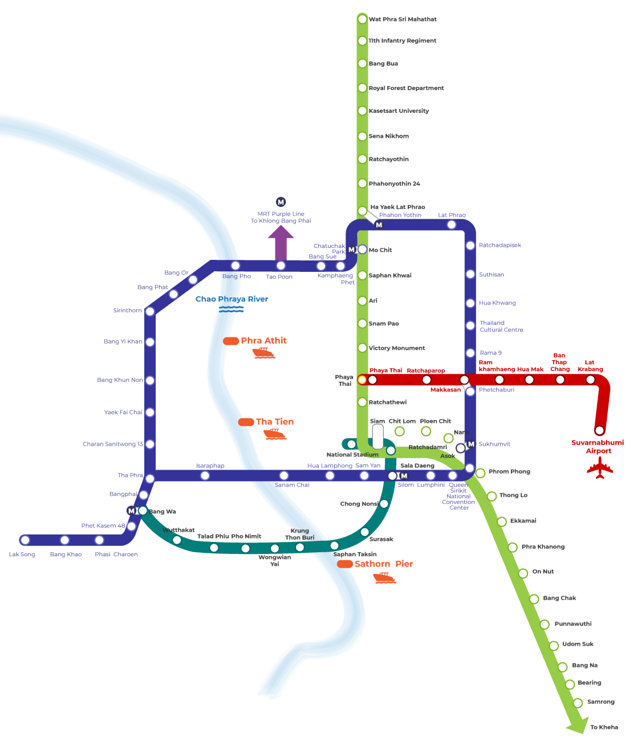 There are three MRT stations in the Chatuchak area. Chatuchak Park provides easy access to the park and Weekend Market. Kamphaeng Phet provides direct access to the Weekend Market. MRT Phahon Yothin is ideal for accessing Central Plaza Ladprao and Union Mall.